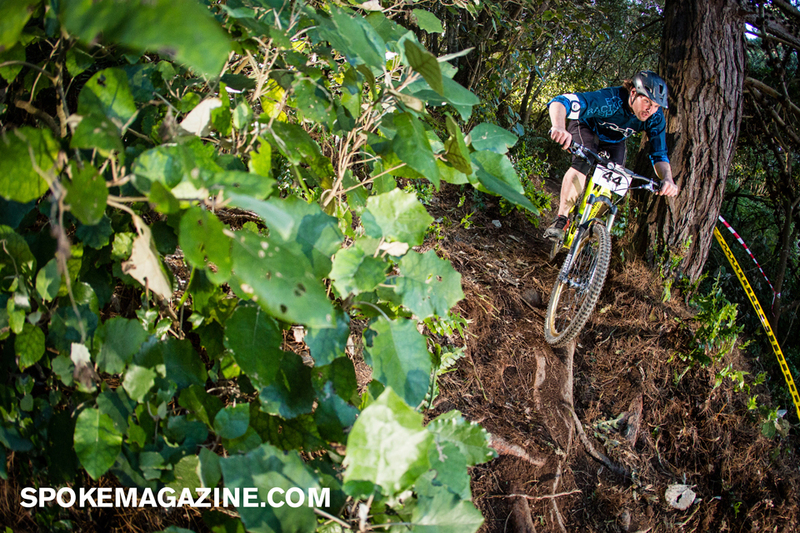 After a week of nervously checking weather reports, 127 racers awoke to a clear and sunny race day in Wellington for the Urge Mt Vic Super-D, run by the Wellington Mountain Bike Club. The course had a couple of new additions, with a couple of small jumps and a short typical "Welly-track" section (tight, off camber and covered in roots) to keep everyone on their toes. The heavy rain throughout the week had left the ground tacky for riders, although a few still managed to find the slippy bits to bring about a couple of spectacular crashes. Eden Cruise smashed the under-15 class, his recent XC racing experience obviously paying dividends. Jack Compton took a slim win (1.2 seconds) from Gregor Wilson in the 15–17 year old class, but they were both nearly 30 seconds clear of the rest of the field. The ultra-competitive masters class was taken out by Karl "Weazel" Patterson, who also took out the fastest run of the day (by 2 seconds). The older men (40+) saw John Jacob edge out Trans-Provence-bound Jonny Waghorn by 5 seconds, and in the ancient men class (50+), Dave Carlyon won despite the after-effects of a nasty cold. Hotly-tipped Sarah Atkin suffered a puncture in her race run, which is unfortunate given that she's finally learned how to actually pedal up hills and has a lot of speed. The class was won by WORD's Ash Burgess, over a minute clear of second place. Abbie Bull put in a strong showing in the Novice Women's class. Finally, Miles Davies smashed the Open Men's field, over 12 seconds clear on both his seeding and race run. Between the track, the close competition and the weather it was an excellent day, and so we eagerly await the 2014 edition. Full results are available here and we will have high res photos of almost every racer up on our Flickr channel tomorrow. But for now if you click on any image in the post, you'll go through to a full gallery of all the shots from today in lo res.